Although a new product announcement from Apple isn’t the major pop-cultural event that it used to be, the pitiless taskmaster that is capitalism demands that the company continue pressing ever forward with sleek new gadgets exciting enough to convince consumers that last year’s gadget just isn’t good enough anymore. It did so today at the WWDC (World Wide Developer’s Conference), its annual in-house presentation of its newest innovations for software developers as reported by The New York Times. 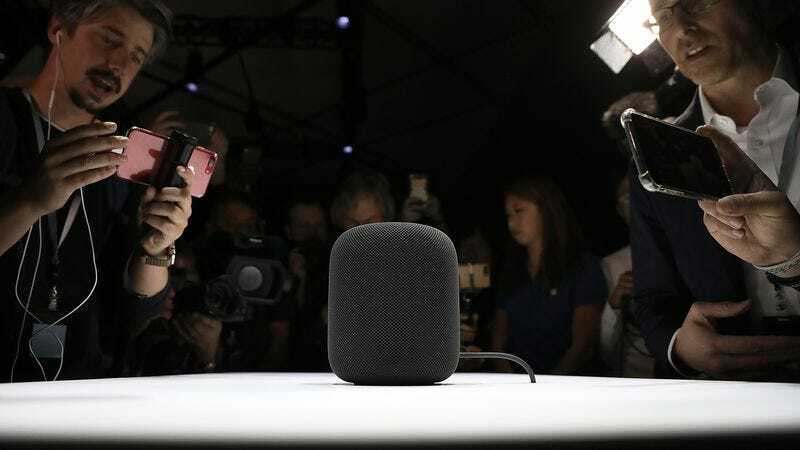 Chief among those innovations is the Homepod, Apple’s answer to Amazon’s Echo and Google’s Google Home. Aside from its rippity-rappin’ name, the Homepod does pretty much the same stuff all those other home assistants do, but with a more streamlined design. Voiced by a reportedly new and improved Siri, the particular gadget will retail for $349, which is significantly more than its rivals—the Echo currently retails for $179 and Google Home for $129—but its speakers are supposedly better than the rest, thus justifying the higher price tag. It will be available in December. Then there’s the new iPad Pro. Apple may be playing catchup in the home-assistant realm, but it innovated tablets back in 2010 with the original iPad; the only problem is, iPads apparently don’t break often enough, resulting in a decline in sales in recent years. So, to persuade existing iPad customers to buy another one, Apple has unveiled an iPad Pro with a 10.5-inch display, in between the 9.7 inch and 12.9-inch models. It’s also got something called ProMotion that’s supposed to ”increase the refresh rate and make motion smoother in video content,” although if it’s anything like the motion-smoothing technology on HDTVs that produces the dreaded “soap opera effect,” that may or may not be a good thing. Regardless, the 10.5 inch iPad Pro retails for $649 and starts shipping next week. Aside from the expected introduction of new versions of its mobile (iOS 11) and computer (High Sierra) operating systems—the latter of which does come with one exciting feature, blocking autoplay videos on Safari—the other big announcement at the unusually hardware-focused presentation was the unveiling of a new version of Apple’s desktop model iMac Pro. The souped-up new version ”will support up to 18 core processors and include a graphic chipset called Radeon Vega,” making it Apple’s most powerful computer to date, according to the NYT. Apple’s been lagging behind in terms of professional-quality hardware in recent years, with its last high-performance desktop model, the MacPro, landing with a thud back in 2013. Giving the new iMacPro another chance won’t come cheap, though: These super-powered new models go for $5,000 a pop and will be available in December.